Why coupons can save your online business? It’s hard to find any e-Commerce websites that do not make use of any coupon plugins in selling online. Let us explain further. So it all comes down to your conversion funnel. Most e-Commerce store owners first get started with their online business by spending money on Google or social ads to get paid leads into their store. Either you have investment funding or bootstrap your business, spending money on generating paid traffic eats into your revenue painfully, especially when we know that ~50-70% of leads may bounce away from your website and never come back. If so, you’re losing a great deal of money. That’s why coupons are so popular and widely used in e-Commerce websites: to keep online shoppers stay longer and drive them down the conversion funnel to finally finish making purchase (and come back again). Simply put, coupons work to turn your hard-earned visitors into paying customers so you do not waste your upfront investment into “buying traffic” beforehand. How to use coupons effectively along the customer’s path on your store? Every step in the conversion funnel, from Click-Through in homepage, Add-To-Cart in product page, to Proceed-To-Checkout in cart page…, needs improving to lead to the highest final checkout conversion rate. With Beeketing’s coupon plugins, you can apply different strategies with coupons in every step to optimize your sales conversion. Let’s explore. You should expect that, if you do nothing to impress or engage with your new visitors right on the homepage, most of them are highly likely to leave your site after less than 10 seconds skimming through. If your copywriting on the popup is attractive enough, customers may be more than willing to become your followers to get a generous discount on their first purchase with you. By doing this, you now have their contact to engage later on social media or by email marketing. Even if they do not complete orders on the first visit on your store, you still have chance to make them come back later on and actually purchase something. Conversion on the first step completed! *Owning a WooCommerce store? Better Coupon Box is the best WordPress Popup plugin you could ever find. The next critical step to continue putting efforts into optimizing conversion is on product page. One of the most popular and effective online selling strategies is upsell & cross-sell promotion – the famous selling tools accounting for 35% of Amazon’s total revenue. Now imagine what happens if you combining coupons with up-sell and cross-sell on your website? A whopping add-to-cart conversion rate is assured, powered by Boost Sales – the smart plugin that leverages both coupon and up-sell & cross-sell tactics into 1 deal! When customers are interested in an item on your store, a cross-sell / up-sell popup will gradually show up to offer a combo of complementary products that go well with the main item. To encourage customers to spend more in order to get the whole combo at best price, we apply gamification rule to excite customers: a header bar offering a big discount if their order value exceeds a certain amount! When the total order value qualifies, the coupon code of 20% discount (on this example) is revealed, just like a reward to customers who “win the game” we pretend in this gamification-like offer. Up-sell & cross-sell are excellent online selling tactics to sell more to each customer, and when powered by coupons, they really boost up your conversion rate to checkout. Now that you move your customers to the cart page, you cannot ignore the fact that 68% of online shoppers abandon their order right here. Thus, taking no action to fix this statistics for your own store would definitely kill your previous efforts. Fortunately, you can boost your conversion rate in cart page to 25% using coupons, with the help of Checkout Boost plugin. 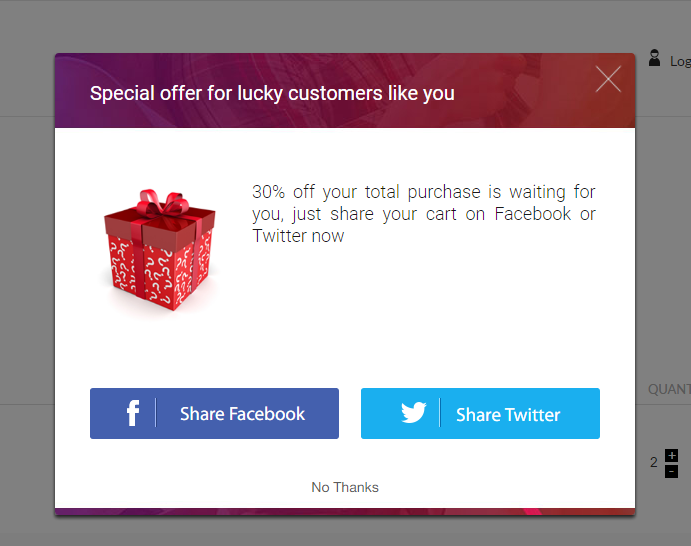 While customers are reviewing their cart and perhaps considering adding / removing some items or even abandoning all, you catch their attention with a last-minute offer popup – which asks them to share their cart on social profiles (Facebook or Twitter) in order to receive a big discount. The quest is too simple and sweet for online shoppers to deny. Just a 2-click share to get a discount on the total cart they are considering, that’s awesome! Plus, not only do checkout-boost offers with coupon increase conversions and sales for you, but they also bring you more referral leads from social network sharing without costing your money like ads. In the end, you’re saving more cost than you think! In case customers leave your store without completing their purchase, how to make convince them of returning and finishing the payment? Email Automation is the wanted plugin that can help you send the same beautiful automated emails with coupon offers to nurture sales like this. In another case, customers finish their purchase when on store and leave happily, does the selling cycle stop there? No, instead you must continue to convert these paying customers into loyal ones who keep coming back and purchase on your store frequently. 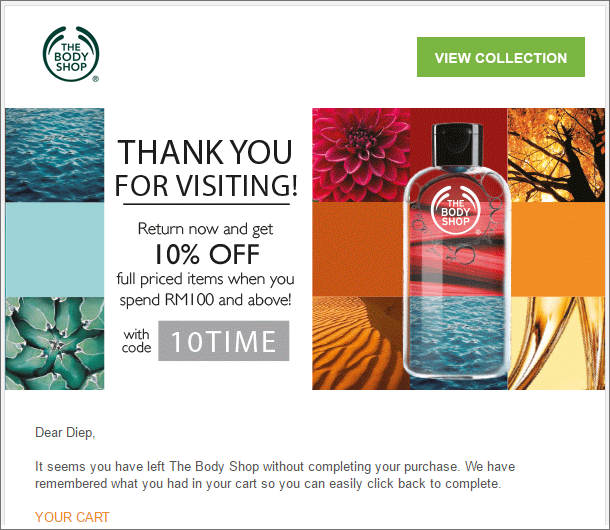 When customers are not on store, email marketing works the best. Email Automation automatically sends a Reward Coupon email campaign to send coupon codes to frequent customers as a thank-you gift. They used to have a happy experience with you, so why not coming back again especially with a discount code? Congratulations! Reading to this end means you have now known all secret sauces to boost your conversion rates with coupon plugins. There’s no reason to just pouring money into generating leads without putting efforts into improving conversion while visitors reach your website. Beside design, UI/UX, you now know that coupons are potential to boost up your sales and could be implemented in different strategies at every step on your store. 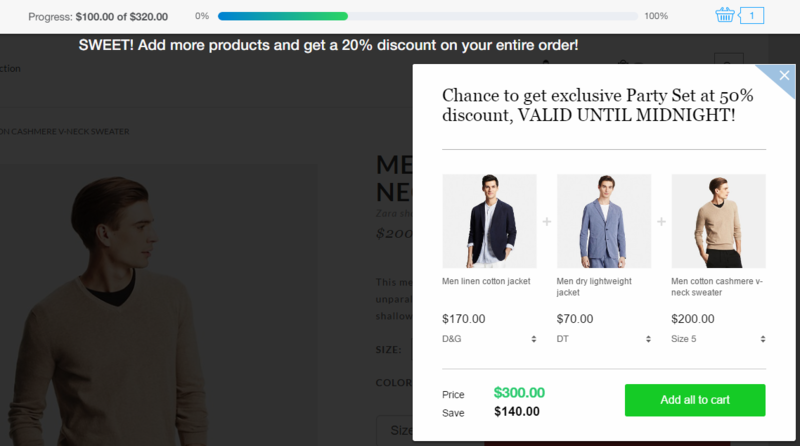 Bonus: coupons can also be leveraged to a higher lever with exit intent popup technology – the very must-have element that every online stores should implement today. Learn more here. Let us know any creative ideas you may have to leverage the power of coupons to share with other e-Commerce sellers! Hey. We have had some success with coupons from a link building / referral traffic perspective by contacting sites / bloggers etc that talk about / review a given product or type of product and offering them a coupon for their readers. It’s a step above but again if that can drive more inbound traffic it just further feeds the top of the funnel. Great article !! Coupons are beneficial for sellers as well as consumers..